As I’ve mentioned before (lots of times, but see here for an example) I use a program called Mother Goose on the Loose for my baby storytimes. It’s a little bit difficult to blog about my baby storytimes then, because much of the program is the same from week to week. That’s by design. Very young children find consistency and repetition reassuring, and it gives them a chance to learn the rhymes and songs to the point where they can eventually join in. But for the sake of shorter, less repetitive, and more readable blogs, I’m thinking I might try something new. While I use the same nine segments each week, I will feature only one segment here on the blog. I’ll try to go in depth with each segment to discuss what we do and why we do it. So this week—-SHAKERS AND SCARVES! I do this in two segments. I pass out the shakers, then we play with them for awhile and put them away before I pass out the scarves. 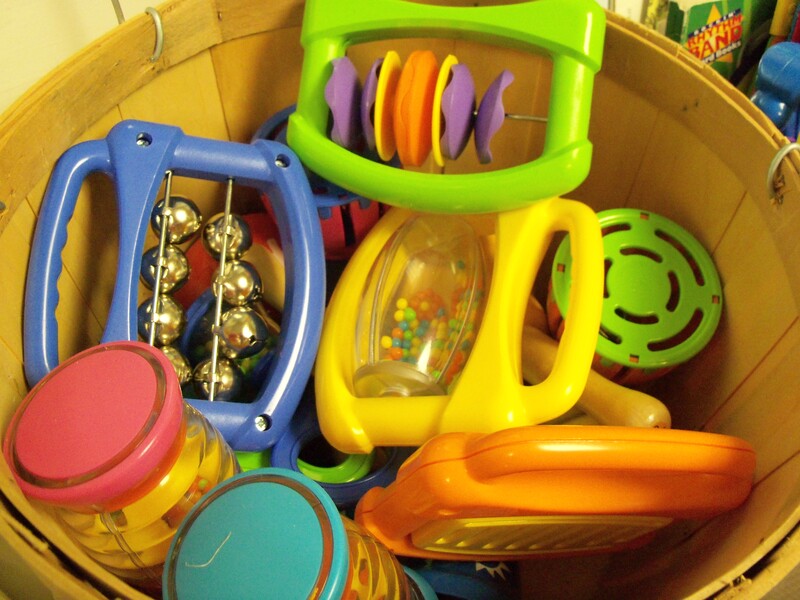 If you are looking for shakers, we got ours from Lakeshore Learning here and here. These shakers are specifically designed for very young children. There are even a couple of smaller rattle-type shakers that I use for children under six months. I also got my scarves from Lakeshore Learning here. This segment comes almost exactly in the middle of the program. Why? Because the little ones are starting to get antsy! What better way to grab their attention than to ring a bell? 4. Here we’ll do a song such as Are you sleeping? or Do you know the ice cream man? 5. Ring them up HIGH, etc. The whole segment is just a few minutes long. We sing the songs without stopping, doing UP HIGH/DOWN LOW in between. Having a song at the end helps the children to part with the bells. If you need a song to use at home to encourage your child to pick up his or her toys, this simple song could do just the trick. *Note that MGOL also includes material for sticks and bells. Scarves are good for movement, games, and colors. 3. 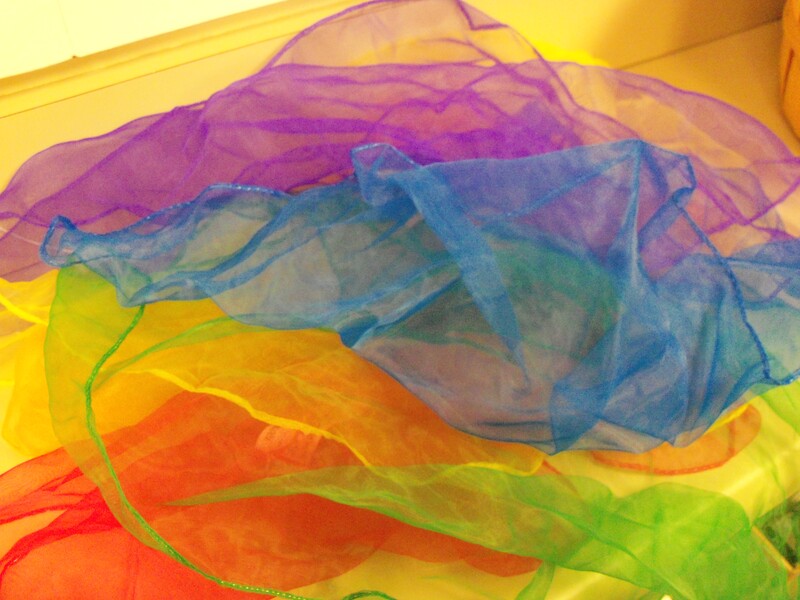 Here we will do an activity with the scarf such as stirring it to pretend we are making a cake, then recite Pat-a-Cake. Or, we will sing This is the way we wash our face and pretend that the scarf is a wash cloth. 4. Right before it’s time to put the scarves away, we will scrunch them up into little balls, then count to three and throw them up in the air, watching them drift down slowly. We usually do this two or three times. 6. Scarves away, scarves away, put your scarves away today. Scarves away, scarves away, put your scarves away. I think the kids really enjoy using the shakers and scarves, and I’m really glad we can offer them. I’m looking forward to finding and trying out new rhymes, activities, and songs to use! uh, oh.. where did you go? I like that one! Thanks for stopping by!